On Friday, April 28, students and alumni convened in room 327 of the Sharp Building to compete in the annual MakeWork Challenge. The MakeWork Challenge offers SAIC students and recent alumni an opportunity to present business pitches for a chance at winning up to $10,000 in start-up funding. This year’s winners are: Sky Cubacub (BFA 2015), Nick Mahshie (MDes 2017), Maryiah Winding (BFA 2017)​, and Justus Harris (BA 2013). 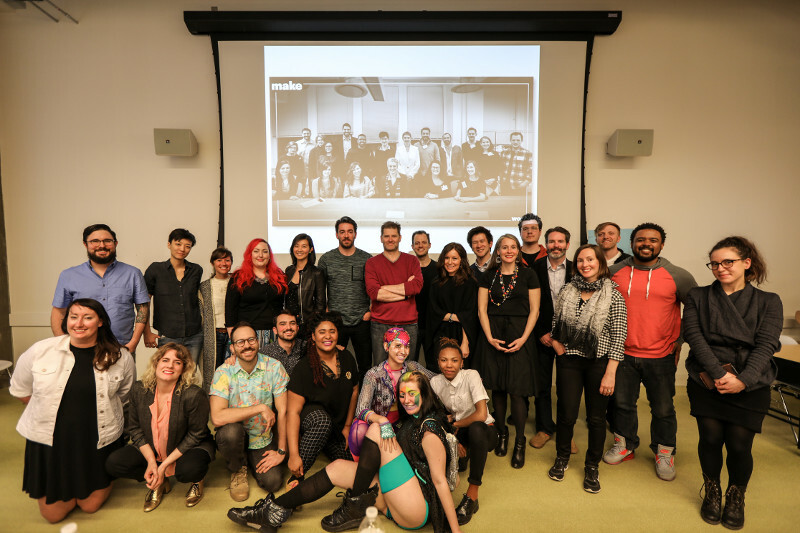 Cubacub was awarded the largest amount to date for their project Rebirth Garments, which affirms queer and disabled identities through clothing, zines, and other resources. Mahshie will be founding Tranqui Print Studio, Miami’s premiere shared-use printmaking studio. Winding will be starting a record label called No Ghost Records that elevates innovative talents in the rap community while centering queer and female voices. And Harris is developing MedSculp, a tool for visualizing diabetes data for condition management. The MakeWork Challenge is an extension of the MakeWork Council, a group of artists, designers, and entrepreneurs at SAIC working to further economic and cultural development in Chicago. To learn more about the MakeWork Council and other opportunities they provide, click here.